The Thomson Foundation’s EU-India Media Initiative on HIV/AIDS is a tremendous resource for mediapersons, both within the Indian context and also internationally. 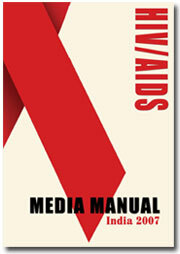 Particularly useful is the HIV/AIDS Media Manual, which is available in English, Hindi, Bengali, Marathi and Tamil. “This Media Manual intends to demystify the subject, set out a road map for the uninitiated reporter and provide fresh inputs to those already covering HIV/AIDS. The chapters address basics, the epidemic, updates on recent happenings and several tools for reporters — ethical considerations, appropriate language, analytical frameworks and story ideas. Journalists work under a variety of pressures — deadlines and competition among them — and our collective task was to make their task a little bit easier. The work of all those who made this Manual possible will be rewarded if this is achieved.” – Savyasaachi Jain, Project Editor. The initiative also runs workshops for journalists and journalism students. Click the coverpage image to visit the website. These are some of the principles on coverage of HIV/AIDS that emerged from the discussions of those who attended workshops under The EU-India Media Initiative on HIV/AIDS. A total of 112 journalists and programme makers from the print, radio and television media attended these workshops during 2005 and 2006 and conducted introspective discussions on the role and methods of the media in covering HIV/AIDS issues. The role of the media in disseminating information was thought to be all the more important in India, where literacy rates are low in many areas. Added to this is the fact that most people get more information on HIV/AIDS from the media than from a doctor or specialist. The participating journalists and programme makers generated hundreds of points of ethical concern based on their experience in the field. Below, the points that emerged from these workshops have been distilled into one comprehensive list. Fear of stigma and discrimination may often compel people living with HIV/AIDS (PLHA) to keep their medical status secret. Respect their wish and remember that while for you it’s another story, for them, it may be a matter of life and death or, at the lowest level, a question of life as they knew it. Meet the PLHA often and build up a climate of trust before you even think of asking them intrusive questions. Even in cases where a PLHA agrees to talk to you, make sure he is aware of the possible fallouts on his life. Talk to him, preferably in his own language, so that you make sure he understands you. Tell him how you will treat his story, where it will be read/broadcast, what is the angle you intend to use. Informed consent is all the more necessary when you are speaking with children, who may not fully understand their situation. In such a case, talk to the child as well as his parents/guardians and make sure they understand why you are doing the story and what could be the effect of your doing it. Give the PLHA a voice. Allow them to voice their concerns, but without bending to their side. Check your story with all those who could be involved — the government, the NGO, the PLHA, their neighbours, the healthcare officials. Use what they have to say, but try not to play up any one group overly. Adequate representation of all stakeholders is important when covering HIV/AIDS. Be especially careful with government policy — check who it impacts and how. Be clear about the purpose of your story and know the audience at which you are targeting it. Don’t sit in judgement on individuals and groups. Be aware of local gender and sexuality issues. Equally, make yourself aware of myths and misconceptions. Use your right to information to examine the role of the government. Make sure your story is legally defensible. Use only language that is sensitive and politically correct. Avoid jargon. Explain all acronyms in the first instance. Use simple, clear and accurate language so that your work reaches the widest possible audience. Your objective is to inform, so weed out all sensationalism from your story. Avoid terms that might be confusing or stereotyping in their effect. To further this objective, check out the headlines on your story with your copy editor. Language should also be culture specific — encourage the use of local dialects. Explain the science as simply as possible. You can never be too careful with facts and figures — go to a second or even third source and check them again. Interpret statistics at all times and put them in the right perspective. Give the source for any data that you use, and ensure it is a reliable source. Research your piece thoroughly so that no errors creep in even unwittingly. Provide all facts wherever necessary, even if they go against the interests of the government or the National AIDS Control Organisation (NACO). Your job is to interpret conflicts, but do take care to avoid confrontations. Check out your sources thoroughly. The most sincere source could have a hidden agenda. Question the role of NGOs. Keep reading about issues connected with HIV/AIDs. This will help you keep your knowledge base updated. This will also help you place your stories in the right context as backgrounds are invaluable in such stories. Use HIV stories across all forms of programming, including entertainment. Introduce some form of it even in primetime programming. Increase their appeal by inserting elements of entertainment. Aim for year-round coverage rather than concentrating your stories around World AIDS Day. Don’t forget a story after it’s done. Go back and see if you can do a follow-up. This is important where government or NGO action is being evaluated. Offer full-length interviews — which include information you cannot find space for in your article/programme — on your website so that the extra information can reach those affected directly or indirectly. Yes, a picture is worth a thousand words. But remember, pictures are also more damning. Avoid stereotyping any group or community in your choice of pictures.